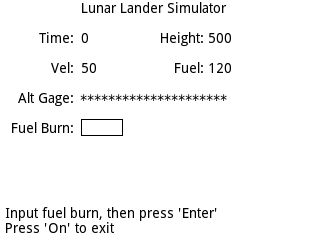 Description: The lunar lander is 500 ft above the moon with a downward velocity of 50 ft/s and has 120 units of fuel. The height, velocity, and remaining fuel are displayed. The program will pause for up to 60 seconds. Enter the number of units of fuel you wish to burn during the next second, then press the Enter key. The new height, velocity and remaining fuel are displayed. The maximum amount of fuel you can burn at one time is 30 units. Adapted from the Rocket program in Basic Computer Games, MicroComputer Edition, 1978 by David H. Ahl.